This booklet has been prepared by Roger and Jenny Mallion as a permanent record of the “Shops Past and Present” exhibition held in Marden Library and Heritage Centre. Opened on the 2nd April 2016 by Beverley McGaw. Who do you think WE are? This booklet has been prepared by Roger and Jenny Mallion as a permanent record of the ‘Who do you think WE are?’’ exhibition held in Marden Library and Heritage Centre. 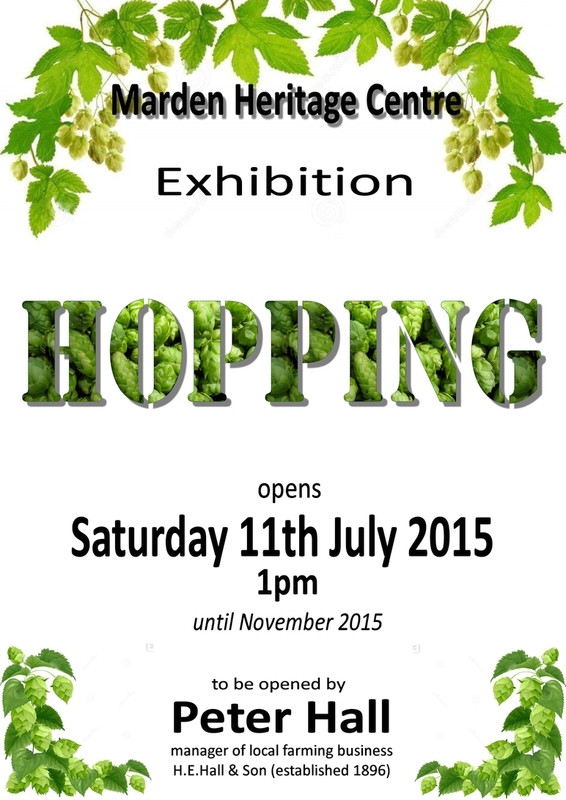 The Shops in Marden, Past and Present exhibition will run in the Heritage Centre, Marden Library for 4 months. 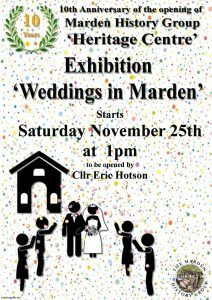 The Exhibition will cover how Marden was able to supply the Villagers with most of their needs by the number and variety of Shops. The whole village used to be alive with shops and you could get everything you needed from Butchers, Bakers, Grocers, Tailors, Drapers, Shoe-makers and Repairers, Stationery and Post Office, Watch and Clockmaker, Coopers, Blacksmiths, Jewellers, Wheelwright, Carpenter, Fruitier, Confectioners and Hairdressers. Goods unable to be purchased were supplied from Maidstone using a horse-drawn ‘Carrier’. 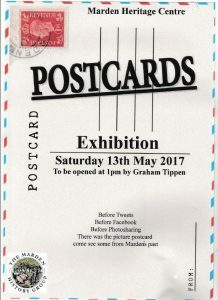 This booklet has been prepared by Roger and Jenny Mallion as a permanent record of the “Hopping’’ exhibition held in Marden Library and Heritage Centre. Opened on the 10th July 2015 by Peter Hall. Hops have been a major crop in Kent, Sussex and other counties for centuries and they are the sole reason for Kent’s unofficial “badge” – the Oast House. 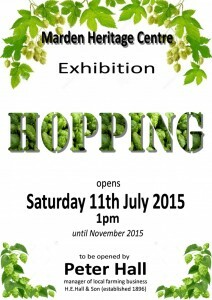 The flower of the hop plant not only adds flavour to beer, it is an effective preservative for the beer but, sadly, there is now only one hop garden in the Parish of Marden (Farmer Peter Hall’s). In previous centuries, the absentee owners of the land would impose taxes on the people who farmed their land so some hop growers started to call their hop fields “hop gardens”, in the hope that the owners might assume that they were the equivalent of cottage gardens and limit the tax to be imposed. Until just a few decades ago, the Autumn saw hundreds of people coming from the East End of London to many of the Wealden villages and the character of Marden was changed due largely to the labour-intensive methods then needed to harvest the hops in September and into October if required. Marden Medical Centre stands on the site of the Hoppers’ Hospital and it replaced the Red Cross temporary first aid post that was set up for the hopping season. Hopping and fruit picking were very popular with the people of the London Docks as it was the only holiday they got and, although the accommodation was primitive comprising a corrugated iron hut for the whole family with no “services”, they were away from the toxic air of London’s East End and they could make money! There are many references to hops and hopping in several of the History Group’s 20-odd publications and in other books we have collected. Marden History Group are proud to announce that its new exhibition at the Heritage Centre will celebrate the collection provided by this notable Marden family. The exhibition features illustrations and photographs collated by Robert Highwood, a former farmer, who was also: Chairman of the Parish Council for 24 years, Vice Chairman of the Marden Fruit Show Committee, Chairman of the Staplehurst Branch of the NFU and a governor of Marden School. 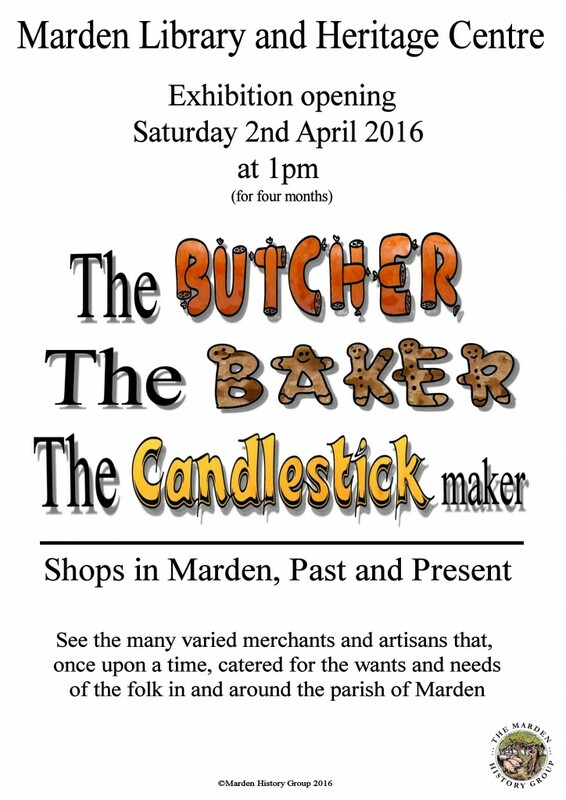 Robert also assisted Phyllis Highwood and Peggy Skelton with the research for their MARDEN A WEALDEN VILLAGE book. “Where other countries have climates, we in Britain just have weather, a daily phenomenon that controls our lives, provides a perpetual topic of conversation and is totally unpredictable”. 22nd February 2014 and 28th June 2014. Opened by Ken Jenner. This booklet has been prepared by Roger and Jenny Mallion as a permanent record of the ‘WWI’’ exhibition held in Marden Library and Heritage Centre. 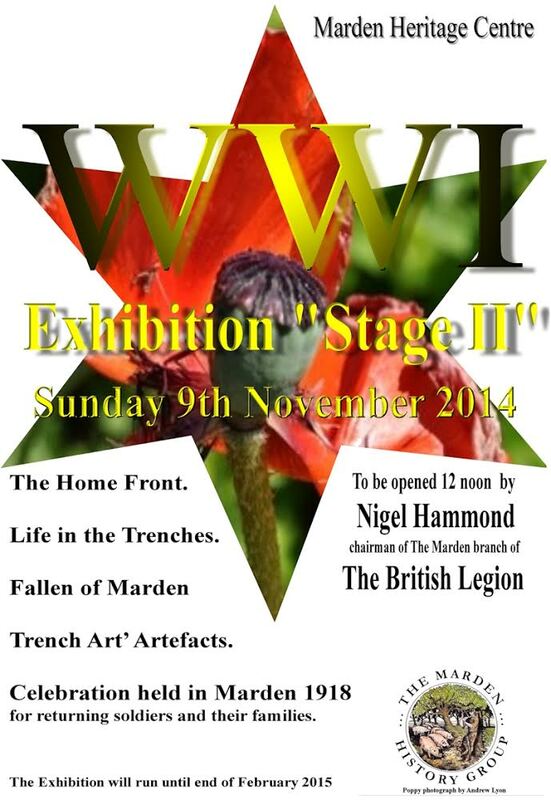 The first Exhibition was opened on 11th November 2014 by Mr. Hammond the local British Legion representative. The second Exhibition was opened by Jo Highwood. Family History Monthly magazine awarded us their national 'Archive of the Year 2010'. All information on this website is given in good faith and to the best of our knowledge, however we cannot be held responsible or liable for its accuracy. We have members of the History Group throughout Britain as well as overseas, thanks to this website. Why not join us too? Visit the Heritage Centre and see our collection for yourself. The Friends are a volunteer group raising funds to support the work of the Marden History Group & Heritage Centre and also to conserve the fabric of St Michael and All Angels Church in Marden.